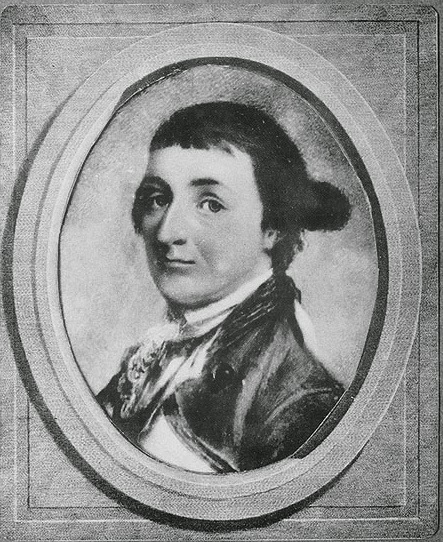 Captain Gustavus Conyngham miniature, artist unknown, date unknown, US Naval Historical Center. The Dunkirk Pirate returns! Conyngham was featured on this blog some time ago. That French depiction of Conyngham may have been colored by his checkered resume. After a wildly successful cruise against the British merchant fleet (and a few neutral vessels), Conyngham was chastised by Congress for his flagrant disregard for orders forbidding taking neutral vessels carrying British cargoes. This portrait, taken from a miniature of Conyngham, is scant in details. He wears no hat, and appears to sport a bob wig and queue. Conyngham's short white shirt collar is folded over his white cravat. His coat is without collar, and has a white lapel lined with gold lace. Dark metallic buttons are sewn in as well.